The Saxons of Transylvania have an entirely different name for Transylvania: it is called Siebenbürgen. This means, roughly translated, 'seven castles'. 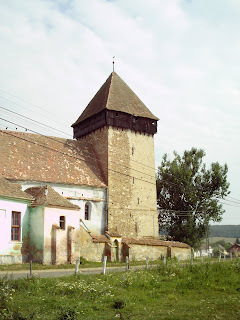 The main city of the Saxons Hermannstadt, is best known by its Romanian name: Sibiu. Up until 1941, primarily German speakers lived there, and after the war many of Germans lived there, but they were not in the majority any more. The other cities which make up the seven 'castle' cities of the Saxons are: Bistritz (Bistriţa), Sächsisch Regen (Reghin), Kronstadt (Braşov) Mediasch (Mediaş), Mühlbach (Sebeş), Schässburg (Sighişoara) and all had strong populations of Saxons. Unlike the other city, they were not in the majority. Most of them had higher numbers of Romanian or Hungarian people in them as compared to the Saxons. However the main place of decision-making, a capital of sorts, was in Hermannstadt (Sibiu). This is of course only part of the name and one of many names of Transylvania.